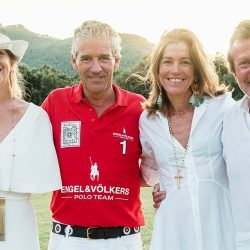 For the ninth time, Christian Völkers from Engel & Völkers hosted the well-known Polo Cup in his private finca Son Coll. The polo tournament took place over two days in spectacular surroundings overlooking vineyards and the Mediterranean with more than 700 employees and guests attending the prestigious event. One of the aims of the tournament was to raise funds for Engel & Völkers Charity, a non-profit organization founded in 2008 by Ninon Völkers. The charity builds schools and orphanages in Togo. A limited edition fan from the firm ‘La Morenita’, by Alma López was just one of the many stylish items on sale for the cause. At the end of the tournament guests enjoyed a traditional Argentine asado, which has become a memorable highlight of this event. Christian Völkers’ historic finca is set in the beautiful Serra de Tramuntana mountains. The 15-hectare property is set over several terraces, stretching down as far as the sea.